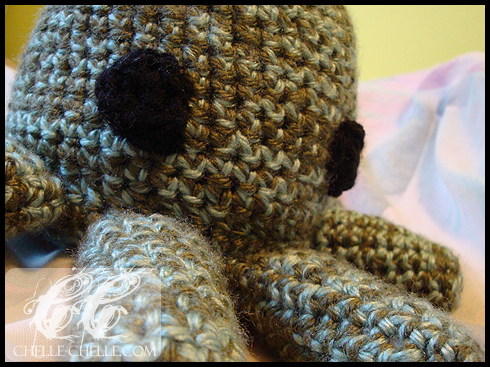 Chelle-Chelle.com – Crochet, Knit, Craft » What is amigurumi? What is amigurumi? Where did the word come from? How the %#*! do I pronounce it? Amigurumi is a Japanese word and encompasses knitted and crocheted toys – usually animals or human-like dolls. They generally have cute features (like big eyes), are made of yarn, stuffed with love (or polyester stuffing). Due to the nature of the stuffie (or amigurumi, I just find ‘stuffie’ to be a lot easier, and quicker, to type out), it is generally recommended that you use a smaller size crochet hook or knitting needles when making them in order to ensure that you are making a tight fabric. This makes sure that when you stuff (with love!) that the stuffing does not show through. There are no ‘strict’ requirements for something to be an amigurumi project. I’ve seen so many different things made: human-like dolls, amigurumi animals (dogs, cats, birds, hedgehogs), inanimate objects (cars, cell phones, books, a pile of poop with eyes and a smile) and pretty much whatever you can think of. Some people say that amigurumi must be done in the round (that means, it is a continuous spiral) rather than joined rows (there is a ‘seam’ and you do individual rows, join and then go the next row), but I have found that there has been many published patterns that call their projects amigurumi that have been done in the round and also in joined rows. However, it is pretty much agreed that they are knitted or crocheted toys. To make a tighter fabric, use a smaller hook or needle size than recommended by the yarn company (it’s printed on the label). If it’s still too loose after doing a swatch, go down another hook size. Another way to make a tighter fabric is to crochet (or knit) with more than one strand of yarn at the same time. Like in my example (points up), the octopus was crocheted with two strands of yarn at the same one but I used the same hook size as recommended by the yarn company. Do not use cotton, beans or rice to put into a toy. Ever. If it gets wet, it can and will get mouldy. Also, do not use beans or rice in a toy that is meant for an infant or child. It’s a choking hazard. Avoid using buttons for eyes for a toy that is meant for an infant or child. If you want to use plastic pellets to weigh down the toy (to make it stand up) or to make a ‘bean bag’ type toy, make a fabric bag and put the plastic pellets into that and sew it up before putting it into the toy. Stuff with love, and might, when using polyester filling. It’s generally inexpensive and very easy to find, so stuff away! If it’s for a child, you’ll probably want to refrain from stuffing it until the seams are nearly bursting (kids like the cuddly factor). But if it’s for yourself, or a decorative toy, stuffing it until it’s fairly firm is a good idea – this also helps it stand up! If your local general crafts store does not carry polyester filling, keep an eye out for steeply discounted pillows or cushions – last time I bought any polyester stuffing, it was $6 for 15lbs.